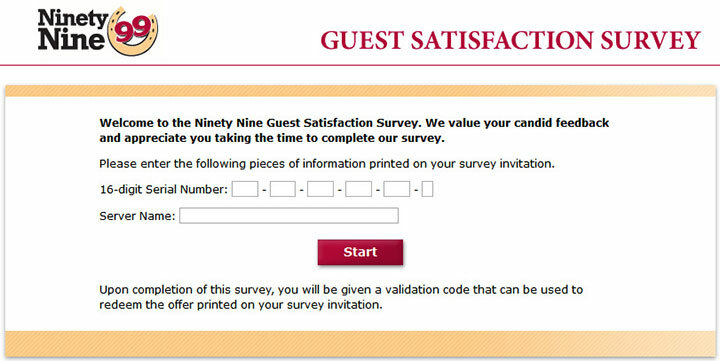 The 99 Restaurants Guest Satisfaction Survey, found at www.My99experience.com, is an online questionnaire designed by 99 Restaurants that rates customer appreciation. Improvements are made because of these questionnaires, as the company reads through them. This survey is done online for your convenience. It is important to participate, if you have been given an invitation to do so. This is the company’s way of talking to you and listening to your situation. Tell them the good things so they know what works well. Tell them the bad things so they understand improvements need to be made and where. This is their way of fighting; they can’t keep you as their customer if they don’t know what’s on your mind. Look to your receipt to find a special offer available if you participate and finish the survey. 99 Restaurant and Pub is a chain of family dining establishments in the northeastern United States. The restaurant serves American cuisine and New England dishes, as well as alcoholic and non-alcoholic beverages. At the bar, customers can order small plates of appetizers or wings with their cocktails, wines, or draft beers. The company is a subsidiary of American Blue Ribbon Holdings, LLC (ABRH). One of four of ABRH’s restaurants, 99 Restaurants hosts weekly trivia events and provides free kids meals when the Red Sox win a baseball game. The entity also offers fundraising opportunities to help raise money for various organizations. Have your recent 99 Restaurants receipt that contains an invitation for the survey. Enter the 16-digit serial number from your receipt. Once you begin typing into the first text box, you can continuously enter the numbers until all 16 are there. You should also enter the Server Name from the receipt. Click Start to begin. Answer questions. Please read directions and questions carefully and answer honestly. More than one answer may be allowed and text boxes may be used. If you are interested in the offer printed on your receipt, you will need a validation code. This code is provided at the end of the survey. Please write it down on the old receipt and present it on a future visit.